Every RM25 spent in a single transaction gives you a stamp. Every incremental RM25 on the same receipt gives you another stamp. 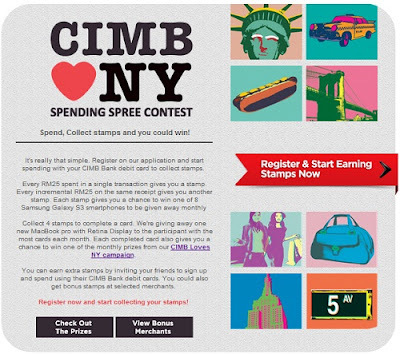 Earn extra stamps by inviting your friends to sign up and spend using their CIMB Bank debit cards. Visit CIMB Facebook fan page for more details. Wow... Samsung Galaxy SIII, only RM999! How to get?